Fight as a well disciplined combat team. Have a damn good time doing it! This group follows basic military customs and courtesies and is not a democracy, however the command staff will listen to group members. 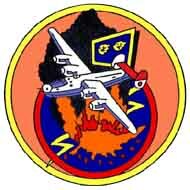 The 451st Bomb Group (H) conducts operations on Tuesday and Thursday nights at 8:00pm EST and Saturday evenings at 8:30pm EST. Each member will recieve, via e-mail, an Air Tasking Order that outlines the pre-planned mission for the evening. The Air Tasking Order (ATO) will be sent out atleast 1 hour prior to the planned mission start time. The ATO will contain all the information to conduct the operation. Rank: Every member is started as a 2nd Lt. Promotions after that are based upon recommendations of Group/Squadron leadership. Awards: Any pilot may recommend any other pilot (including those from other groups that assist us durring operations) for any award that we offer. Recommendations are sent via e-mail to the group commander for review and authorization.